The clinic offers routine supportive veterinary care and, should any emergency first-aid be required, the specialists are on-site to treat the horses. Nine specially equipped horse ambulances will also be on the venue if any horses need to be transported to the clinic. In addition to the clinic, a network of physiotherapists is on hand to keep the horses in top form, while the horses’ temperatures, food and water intake, and weight are permanently monitored by their grooms and veterinary specialists. 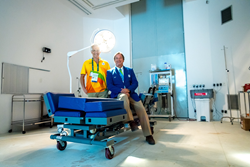 Wolff (65), who will be working directly with Olympic Veterinary Services Manager, Brazil’s Juliana de Freitas (40), has been the Brazilian Equestrian Federation’s head veterinarian for the last 15 years. He was Brazilian team vet at the Seoul and Beijing Olympic Games, and runs his own practice in Sao Paolo specialising in horses competing in the three Olympic disciplines – Jumping, Eventing and Dressage – and racing.